Isabelle Hebey and Yves Saint Laurent launched what was to become a handbook for boutique design: oxblood-coloured dividing walls and openwork panels, brushed aluminium display cases, mauve-coloured furniture by Olivier Mourgue, mirrored walls and round lamps made of Japanese paper by Isamu Noguchi. 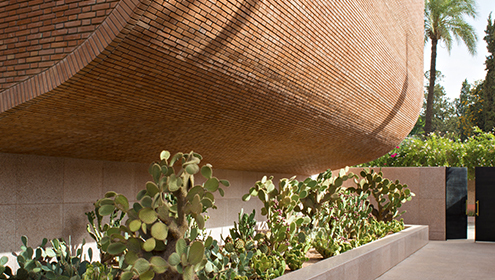 The bookshop at the musée YVES SAINT LAURENT marrakech reinterprets these iconic precepts of boutique design. The public arrives at the bookstore after enjoying the exhibition, thus prolonging the immersion in the fascinating universe of Yves Saint Laurent. 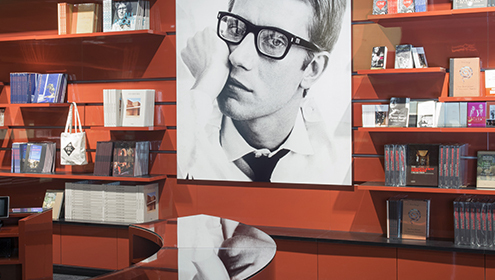 At the bookstore, one finds volumes related to Yves Saint Laurent, fashion and Morocco, or work shown in the temporary exhibition hall. The couturier’s presence is felt in the posters and his iconic LOVE postcards. The bookstore displays a selection of re-edited jewellery by Loulou de La Falaise – the legendary jewellery and accessories designer at the Yves Saint Laurent fashion house. Also available are books and films that inspired Yves Saint Laurent, including cinematic masterpieces by Luchino Visconti or In Search of Lost Time by Marcel Proust, which evoke an ideal library and private film archive at the couturier’s home. The materials used in the café reflect the simple and subdued atmosphere of the couturier’s workspace. The pale-coloured wood, plaster light fixtures and white marble at the café’s entrance create a monastic and contemporary feel. A large, panoramic drawing by Ulrich Gassmann of Yves Saint Laurent’s Paris studio reminds us of the café’s namesake. The calmness is underscored by the wicker furniture; its saffron colour brightens and provides warmth to the room. A harmony of styles and cultures is provided by the Japanese-inspired curtains. 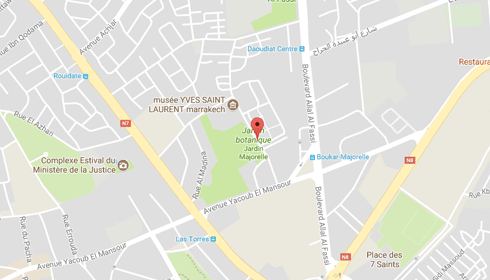 More than just a café, this is a place one retreats to after the emotional impact of the museum. Le Studio can seat up to 75 people. The menu offers traditional Moroccan and inventive French dishes that take advantage of the best quality local ingredients and produce. The landscaped areas of the mYSLm reflect the wide diversity of plants cultivated in the country. Sourced locally from specialist plant nurseries in the Marrakech region, they include varieties native to Morocco as well as those introduced centuries ago and well-adapted to the particular climatic conditions of this desert city. Pink Trumpet Vine (Podranea riscasdiana) cascades down into the square, blue and green glazed tiled patio as one enters the museum, creating a cool and refreshing ambience that contrasts with the hot climate of Marrakech. 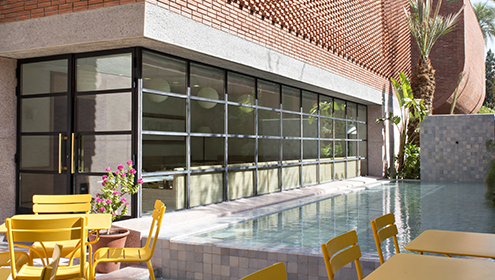 A large rectangular-shaped reflecting pool lined with zelliges (Moroccan glazed tiles) outside Le Studio Café provides another relaxing and tranquil setting for visitors. It is surrounded with luxuriant, large-leaved plants such as Papyrus, Giant Strelizia, Monstera, and Philodendron that create a jungle-like Henri Rousseau atmosphere. Originally native to Mexico but commonly found throughout Morocco since their introduction to the country centuries ago, Barbary Figs or prickly pears (Opuntiaspp) are extensively planted towards the exit of the museum, where visitors can enjoy their unique shapes and diversity of colour and form.